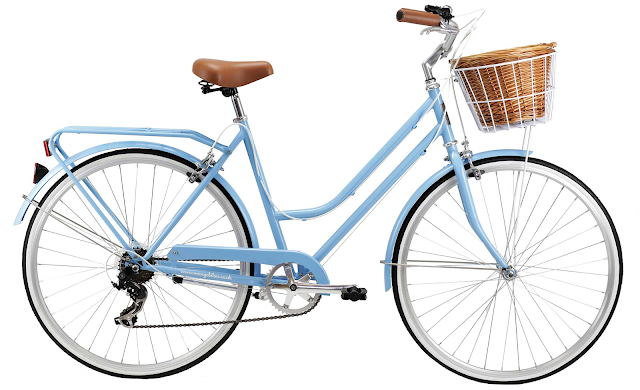 She's the Ladies Classic from Mango Bikes in sky blue and set me back £329.99 including the basket but you can get one for £299.99 without a basket (though I'm not sure why anyone wouldn't want the basket!). I absolutely love the colour but there are other options, she also comes in: cream, black, pastel green and raspberry pink (which is on sale for £269 atm!). I was actually pretty tempted by the black which just looks so stylish and the green is lovely too but my friend has that one so that made my decision easier! In real life, she's a little darker than she looks on the website, but, nothing major and still super pretty - the pictures at the end of this post are a bit more true to colour! In terms of the price, I think it's a pretty good deal. I had my eyes on a Tokyo Bike or a Bobbin before I saw this one and even with a basket she's wayyy cheaper than either of those. I've also been cycling to work now so I've connived myself that I will have made my money back in 3 months (so, now!) because I won't be buying a travel card. This would be entirely true if I wasn't also topping up my oyster card for those journeys that are just a bit out of my fitness range, but still, money has been saved people. Before the bike's shipped to you, it's built and quality checked which is good news, the bad news is: it's then taken apart and sent out to you to build again when you receive it. I mean, I'm sure there is some logical reason for this, but, the box it arrives in is so huge it almost tricks you into thinking it's already built, but no. There is a helpful youtube video showing you all you need to know featuring some guy called Pete. Heads up: you'll feel you know Pete so well you'll probably want to invite him over for Chrismas by the time you actually build the thing. So, you know, at least your social circle is widening! Building it was actually not so bad though. I say that, but to be honest, James, my boyfriend, was the designated builder. I had the important job of holding the bike still whilst he attached all the pieces. I do think it would be difficult to assemble on your own, but, definitely not impossible as proven by my friend, the proud owner of the pastel green lady. During the build I was super sad to see that part of the frame had been scratched and a chunk of the paint was missing. That sounds way worse than it was, but, there was a chip and it made me sad. I contacted the guys over at Mango and they were really nice and offered to send me some touch-up paint (and a 10% refund after a few emails...). I mean, sure, I still haven't received the paint but they did say it was currently out of stock and, ever the optimist I'm sure it'll be on it's way to me soon. Sizing. she comes in two sizes small (4ft11-5ft5) and large (5ft5-6ft). I am 5ft4 and opted for the small, naturally. Interestingly enough when I ordered mine the small size was listed as 4ft11-5ft4 so I was on the cusp of small and large. Now, there are lots of things wrong with my body, sure, but I'm fairly sure I'm evenly proportioned and this bike is so big that I could *just* about touch the floor. With the saddle pushed as low as possible! I'm a new cyclist and not so confident on the road so this was a concern for me. The more I used her the easier it did become although, because the saddle was so low down, my legs never fully stretched when cycling. This meant that after even a short amount of time it became quite uncomfortable. Despite my objections, James recently raised my saddle a tiny bit and it has made a big difference (don't tell him that!). I still can't completely straighten my legs but the improvement is definitely noticeable. Wear and tear: I think we can all agree that the main attraction to this bike is how she looks. That said, it's even more important to me that she stays looking nice for as long as possible. I'd definitely say this bike is best stored inside. I leave her locked outside my office when I'm at work and, obviously it's rained a fair bit in the past few months. The chip that she arrived with has started to rust and so have other parts of the bike where the paintwork has come away slightly (the pannier rack). Again, this sounds worse than it is and most of the rust can almost be rubbed away, but, it is a little annoying. The basket is also best kept inside, it's made of wicker and I (perhaps stupidly?) leave it on my bike. In the rain it's been damaged a little. Still completely functional, just a tiny bit dirty looking. In spite of the above, I adore this bike! It's just SO lovely. I mean sure, it's not perfect but I feel great when cycling, she's cheaper than other pretty bikes and she almost makes me excited about the extra 40 minutes of exercise I've just added to my daily routine. What do you think? How have you incorporated some fun exercise into your daily routine? MANGO LADIES CLASSIC is looking awesome. 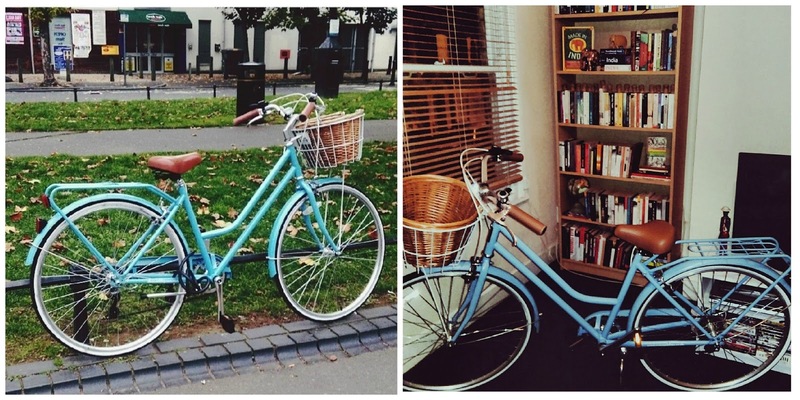 I like the vintage style bikes also. I have my own biking store you can check out my blog for more details about my passion. I adore your publish. Let me turn up to come back to examine for new threads. Nice post.